Hi all! It’s been forever and a day, but with the holidays coming up I was thinking about books (the perfect gift)(porque claro), and about which books I’d recommend across different age groups and interests. 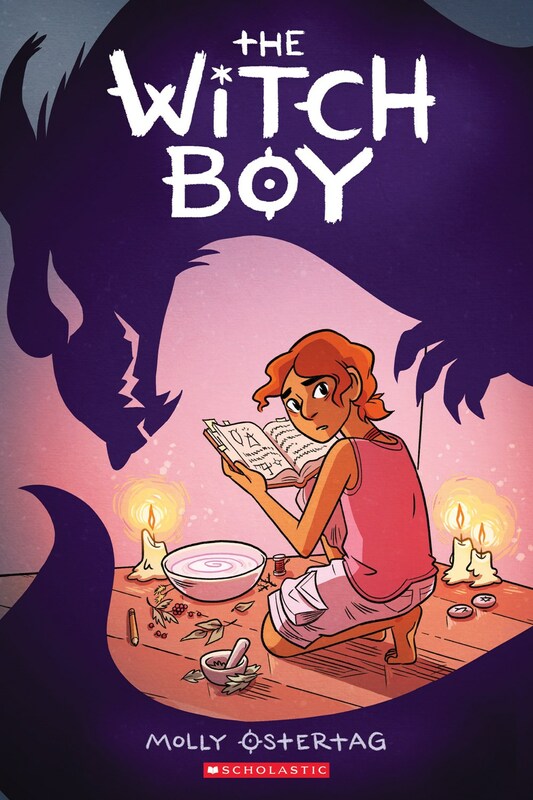 And one book that I’m happy to recommend to almost anyone is Molly Ostertag’s graphic novel The Witch Boy. It has: magic, coming of age, feeling like an outsider, and making new friends. It also takes a look at gender roles and societal pressure. It is a fun story with a healthy dose of tolerance and empathy – something we could all do with a little more of. Everyone in Aster’s family is born with magic. Boys grow up to be shapeshifters; girls into witches. No exceptions. But Aster can’t seem to get the hang of shapeshifting. Instead, he spends his time spying on the witchery lessons the girls are getting. He seems to have a knack for casting spells and wants to know more, but the only person he can share his growing gift with is Charlie, a girl from the non-magical side of town. Then, during a night of shapeshifting practice, one of the boys goes missing. Aster knows he can search for the boy with the witchcraft he’s been secretly learning. Could breaking his family’s most important tradition save the day—or ruin everything? Aster is a boy, and in his world, boys become shapeshifters. But all Aster is interested in is witchy magic, which only women and girls are allowed to learn. He tries to learn on his own, but he’s discouraged and bullied by turns, until he meets a girl who doesn’t know about magic, and doesn’t care that Aster is interested in the “wrong” kind. When his community is threatened, Aster must find a way to help, using his unique talents, and finally be his true self. Things I liked: witches! Parents who are alive! Multi-generational, diverse families who are involved in their kids’ lives! Breaking down gendered activities & stereotypes when they don’t work! Also, the beautiful art and vibrant coloring and the sweet story. I’ve praised Ostertag before for doing so much worldbuilding in her art, and The Witch Boy is no exception to that. While the story is solid, it is the art that takes it to the next level, and I can’t wait to see what Ostertag does next. A friend who read this book early lamented that it lacks subtlety, and I agree. I don’t think that’s necessarily a bad thing, though. I know that there are readers who picked up on subtle hints and metaphors from a young age, but I was not that reader. I needed the direct storytelling (sometimes still do – subtext is largely lost on me unless it's religious – thanks, upbringing!) and I know this book will be perfect for kids who like answers and definite endings. Another thing: this book has the kid seal of approval! After I read it I passed it along to a coworker who has two boys, ages 11 and 9. Both of them gobbled it up within a weekend and really enjoyed it – their mom was super impressed by how fast they read it! In all, The Witch Boy is a solidly entertaining graphic novel for middle grade readers, with a great message and lots of heart. Recommended for: fans of middle grade fantasy, and readers of all ages who like graphic novels and magic. Fine print: I picked up an ARC of this book at Book Expo for review consideration. I did not accept any compensation for this post.